Decorative Concrete of the First Coast in Jacksonville, FL. One of the most prominent features of a home's exterior is the front porch. Whether it's a small landing welcoming people to your door, or a wrap-around patio with room for seating so you can watch the world go by, the porch is a highly visible and important design element. 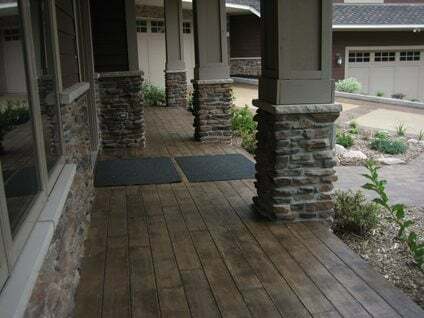 If you want to make a great first impression with visitors and passersby, see these ideas for using decorative concrete to dress up a new or existing front porch. Elite Crete Corporation in Valparaiso, IN. 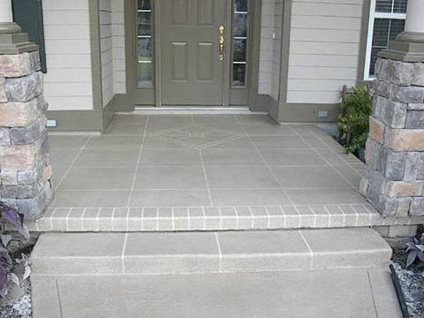 A stamped concrete porch with matching steps make a dynamic duo. Using the same color and pattern for both unifies the look and creates a seamless transition to your front door. 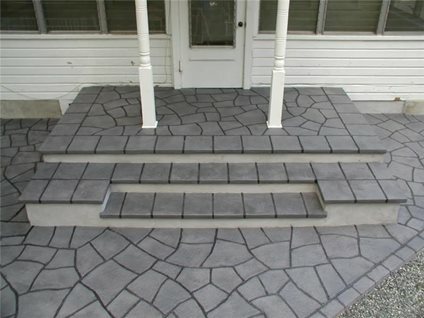 If you have a plain concrete porch that's in good condition but has no curb appeal, an easy solution is to freshen it up with a decorative overlay. 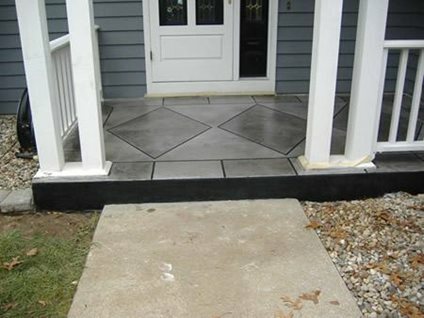 This formerly drab porch was given a thin overlay with a diamond pattern enhanced by stain and dark grout lines. Learn more about this project and see before and after photos. 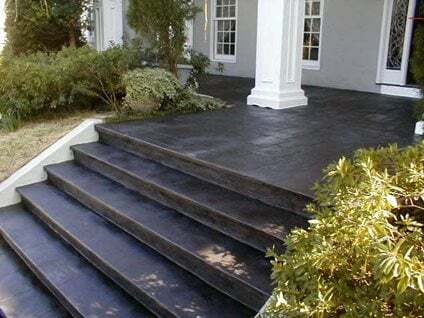 This plain-gray concrete porch and sidewalk was completely transformed by engraving and acid staining. The stone pattern and reddish-brown stain now complement the brickwork of the home's exterior.Read more about this porch makeover. Artisticrete, LLC in Noblesville, IN. 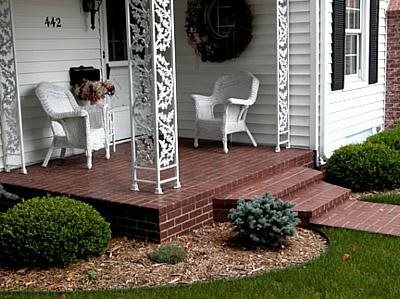 It's easy to give your concrete porch the look of traditional hand-laid brick, and often at a lower cost and with less effort. 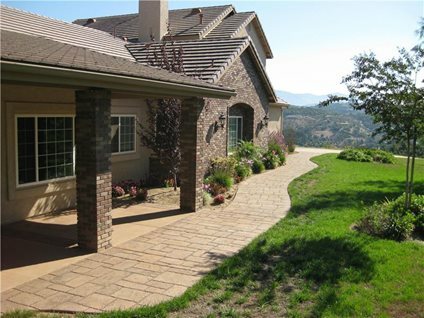 For newly placed concrete, you can imprint the brick pattern with a stamp (learn more about stamped concrete). Or you can cover existing concrete with an overlay and use stencils for the brick pattern (see the step-by-step process). With either method, you can choose whatever color you want for the brick and grout lines. You can also find stamps with wood plank patterns to give your concrete the realistic look of wood without the maintenance headaches of periodic staining and sealing. The plank pattern from this porch extends down the sidewalk, and then forms a border for a large driveway to tie the landscaping into a harmonious whole.See more photos of this project. Unique Concrete in West Milford, NJ. This porch and adjoining patio was previously covered with old tiles that were starting to delaminate and spall. Resurfacing it with a layer of unbonded, reinforced concrete and then stamping it with a random stone and tile pattern restored the structural integrity and curb appeal. See more before and after photos.